The River Grille at The Bristol Hotel has launched a new menu that includes old favourites (think steaks and fish & chips), as well as innovative new dishes, such as a Salad of Heritage Tomatoes with foraged nettle pesto and a spatchcock spring chicken with chimichurri sauce and caramelized lemon. The common theme running through all the dishes, however, is the focus on using produce from regional farms and suppliers. For example, all of the meat on the menu comes from within a 40-mile radius of the hotel, ensuring provenance and low food mileage. All the lamb and beef on the menu is supplied by Ruby & White on Whiteladies Road in Clifton and is free range, with farmers being part of the Quality Farm Assured scheme. Meanwhile, The River Grille pork comes from West End Farm in Devizes, Wiltshire, where they still use traditional farming methods to rear pigs in a sustainable and ethical way. The River Grille’s fish has travelled a little further, but still comes from the West Country, being supplied straight from Devon’s Brixham port. Wherever possible, the restaurant uses fish from sustainable stock. Highlights on the menu include a starter of Potted “Bath Chaps” (pork cheeks, pea custard and horse radish crème fraiche) and a main course of Grilled Rump of Nailsea Lamb, with brinjal spiced potatoes, onion bhaji and mint yoghurt. For pudding, there’s a delicious lemon posset with English raspberry jelly, sorbet and poppy seed straw, not forgetting the selection of West Country Farmhouse Cheeses that are sourced from nearby St Nicholas market. As always, The River Grill menu caters to a wide range of diners, including vegetarians and those who keep to a gluten free diet. To see the new menu in its entirety, please click here. 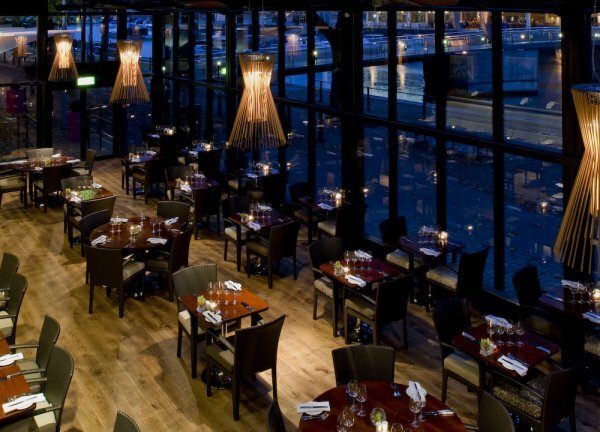 In addition to the a la carte menu, The River Grille has a regularly changing Market Menu, with two courses costing £19.95 and three courses costing £24.95.